I'm having some display issues with Outlook 365 (web version) and Gmail (desktop version). Neither mail client will recognize the valign code. All the other email clients display as intended. Below is a screenshot of how the alignment should display. The next screenshot shows how Outlook 365 (web) and Gmail (desktop) are displaying. Notice how the text links are residing in the center of the td cell instead of at the bottom as intended. The current code for the background image, table set up and header area are provided at the bottom of this post. If anyone can review the code pasted below and see what I'm missing, it would be much appreciated. I've tried all the usual adjustments and nothing seems to accommodate Outlook 365 and Gmail desktop. Thank you to all for your quick response and expertise. Looks like valign is missing from a couple <td>s next to the navigation. Try adding valign="bottom" to those as well. Does the valign need to be added in order to influence the other TD cells? I was under the impression it wasn't due to the existing display:block. Educate me! I'm all ears to learn! A added the valign="bottom" to the TD cells just to the left on the same table row for the sake of consistency, then transmitted another test. Unfortunately, no change? Any other ideas? Thanks! I've taken a closer look at your code. You've got a <p> tag around each navigation link, with no styles. Are you using a reset CSS of sorts that's not included here, such as in the <head> that gets inlined? Without it, the email clients decide how much margin is used above/below the copy, which could mess up the alignment. To make it simpler, you could even just use the <a> tags for the links on their own, without wrapping them each in a <p> tag. In addition to that, you could even apply the styles from the <span> tags inside of the links directly onto the <a> tags to make it even simpler, removing the <span> tags completely. If you haven't I recommend using the Inspect tool in a browser such as Chrome to see what's going on, if it's a margin/padding issue on the copy elements of the navigation. Previously, there were no <p> tags in the code and I did originally attempt using commands within the <span> tags. As a result, the email clients refused to look at any code that would recognize alignment commands. The only hack that worked was to add the <p> tags. After adding those, suddenly the email clients would honor the left, center or right alignments. 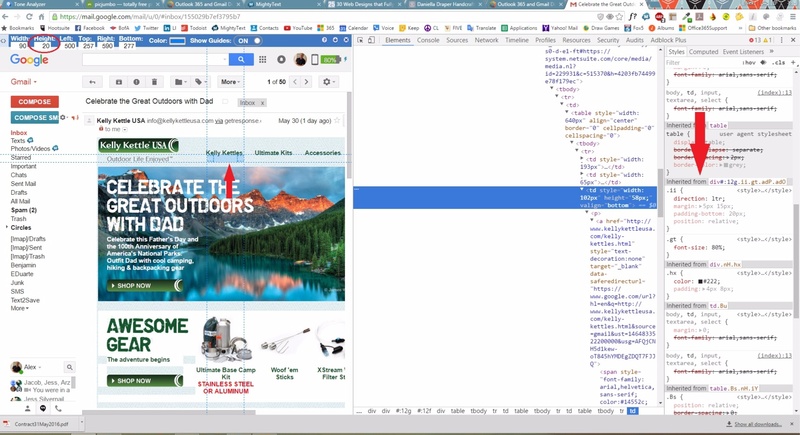 I followed your recommendation to inspect in Chrome, so I popped open the Gmail desktop item and see there is a 20px padding added as an inherited style for which I don't know how to correct or offset. See the URL link to a screen shot at the bottom of this post. Do you know how to shut off that style inheritance? It appears to be something Gmail adds when doing its layout interpretation. I don't know enough about the subject to speak intelligently. Any feedback is welcome. It's hard to tell from the screenshot, but I believe the extra space below you're seeing is a normal margin being applied to the <p> as there appears to be nothing in your code sample provided to override this. Move styles from the <span> to the <a> and remove the <span> tag. This should work around the issue of more space below the links that you're seeing. However, they may now be too low — so you can see in the code here I also added CSS padding-bottom to the <td> in the style attribute to push the link up — you can remove this or adjust it for however you need. Hi, Alex. Try adding valign="bottom" to the <tr> tag as well as the <td> tags. Does that help? And as Courtney suggested you can clean up your code. You can move the text-align attribute from the <p> tag to the <td> tag and the text attributes from the <span> tag directly to the <a> tag. Then you can remove the <p> and <span> tags from your code. You don't need the text-align attributes in either the <span> or <a> tags.